No doubt that the motion sensing applications are taking full benefit of the availability of low cost and adapted specifications of 3 axis accelerometers, 3 axis gyroscopes and 3 axis digital compass. The total market for such devices (according Yole Développement recent report “MEMS for smart phones 2010”) was $300M last year for mobile phones and will go higher than $1.2b in 2015. In addition to the smart phone and mobile phone applications, you have to add the game consoles, the remote controls, the digital and video cameras… and almost all consumer electronic devices are already or will soon integrate motion sensors. Of course, with such growth of the market, the price decrease is extremely important, more than 5% every 6 months… So the 3 axis accelerometer was $3 in 2006, now is below $0.70 in volume. 3 axis gyroscopes in volume have a price of $2.50 at the moment and we can expect a very strong price decrease. STM and Bosch Sensortec are now taking full benefit of the 8’’ manufacturing facility used to produce MEMS devices and Invensense, as a fabless company, is also benefiting of both 6’’ and 8’’ production facilities from its manufacturing partners, especially Dalsa Semiconductor and TSMC. It will be extremely complex to compete against these 3 companies without a similar production infrastructure. All the existing players staying with 6’’ production facilities will at one point or the other have a decrease of their competitive advantage due to the cost benefit of the 8’’ production line of their competitors. So which company can survive? Yole Développement has identified more than 50 companies worldwide which are competing on the motion sensing business. But really only few are really making good business in the consumer electronic market. 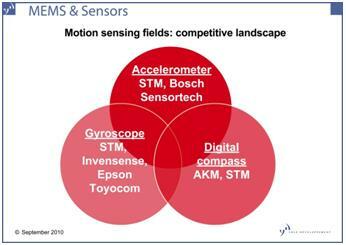 In all 3 fields (accelerometer, gyroscope and digital compass), 1 or 2 players are dominating the business: STM for accelerometer (50% market shares) followed by Bosch Sensortec; Invensense for gyroscope (almost 40% market shares) followed by Epson Toyocom; AKM for digital compass (more than 70% market shares) with no follower… STM is the only one now involved in all the applications (accelerometer and gyroscope with own device and sensor coming from Honeywell for the digital compass) but is competing with companies that are already very strong and deeply entrenched in each field. Few other companies like Kionix (acquired by Rohm) are able to come back in the first league but it will be extremely difficult for the others (Freescale, ADI…) which are focusing on more profitable business outside consumer electronics. What will happen now? Fight of the 5 main competitors STM, Bosch Sensortec, Invensense, Epson Toyocom and AKM.